ARTS ALIVE CHICAGO is the home of community paint projects like “Have A Seat” staged @ 6 Corners BBQ Fest 2017 . AAC’s newest member Amy Jo Arndt produced the highly successful chair event, coordinating 20 artists and sponsors to decorate chairs that now adorn the northwest side streets. 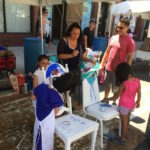 With the tremendous help from Sip and Paint, dozens of children and families enjoyed painting additional chairs at the fest.